Operating action on the large layout of the Highland Pacific Railroad. The 2019 Spring Open House and Swap Meet is scheduled for June 1st and 2nd. A revival of an old Highland Pacific Railroad tradition, two open house weekends each year, is back with the end-of=spring Open House. We will be hosting and on-site swap meet for the first time in many years. When: Saturday, June 1st and Sunday, June 2nd. In addition to the swap meet and layout operations there will be a special operating Lego train layout on display, big raffle, food sales, and live action video of riding the model trains over the large club layout. Ray Olesen has done it again. He has provided a comprehensive run on the mighty Highland Pacific Railroad. Ray’s work is a fitting documentation of the 70th Anniversary of the Highland Pacific Railroad. See the video in the Photos/Videos section of this website. Moms, dads, and kids of all ages waited in anticipation of getting in to be able see, up close and personal, the mighty Highland Pacific Railroad. After 5 days and 25 hours of showing off the Highland Pacific Railroad has come to a close. 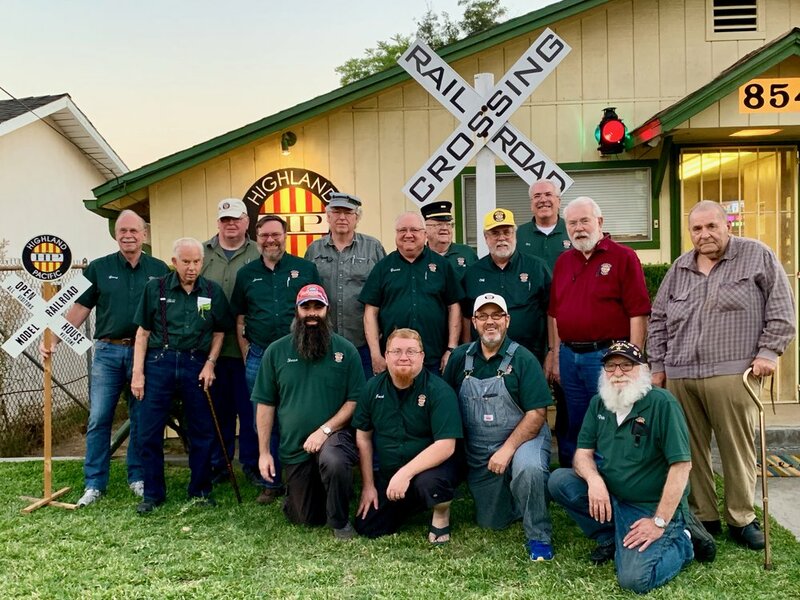 The extra days and extra hours demonstrated why the Highland Park Society of Model Railroad Engineers, Inc. Has one of the better-known, larger model railroad clubs in the greater Los Angeles basin. Activities included operations, displays, Lego Railroad, food sales, and a big raffle. The schedule of events, getting the layout and clubroom in shape, and detailed planning were the work of Steve Smith, Sr., who served as Open House Chief. Those in the picture, kneeling from left: Steve Smith, Sr., Assistant Superintendent and Open House Chief, Jack Ross, Marc Thrasher, Pete DeBeers. Standing from left: Gerry Willis, General Superintendent, Bill Chappell, Dave Dodds, James Keena, Paymaster, Dave Flynn, Bruce Turner, Lindsay Smith, Chief Clerk, Cliff Bender, Ray Olesen, Arie Korporaal, Jerry Duncan. 3D printing has amazing uses from creating artificial organs, prosthetics, architectural models, toys, guitars, parts for motor vehicles and rocket engines, and even chocolate bars. On the HPRR 3D printing has been used to "print" housings for layout control panels and now, floor lighting fixtures. At the Highland Pacific Railroad 3D printing was used to make LED holders to be installed for floor lighting. These little gems originated with a broken LED tube. Rather than throw them out Dave Flynn decided to recycle the LEDs in the club's floor lighting project. The LEDs were removed from the broken fixture and a single LED was used to design a fixture to house the LEDs. The fixture was then "printed" on Dave's 3D-printer.The addition of a couple of wires, 2 screws for mounting, a resistor, and voilà, floor lighting fixtures for the layout room for about $0.40 in parts. This will be especially useful for those times we operate the Highland Pacific Railroad in "night running" mode.